For a big Diamond kite, this Eddy-style design is rather efficient in light wind. Mine has performed well at all our local inland flying spots, which tend to be very gusty. This kite has been up in more moderate breezes too, but it's really best as a light-wind kite. Just about everyone has seen a Diamond kite, whether in the air or just as an image somewhere. But onlookers will immediately find this one a little odd, and perhaps look twice - since it has no tail. My most enjoyable flights with this kite have been on quite long lines of up to 120 meters (400 feet) length, on 'light wind and thermals' days. You don't often hear of Diamonds going overhead, but this one is certainly capable of it. It's a lot of fun! *** A kite with twice the span and 4 times the sail area of the Dowel Diamond. 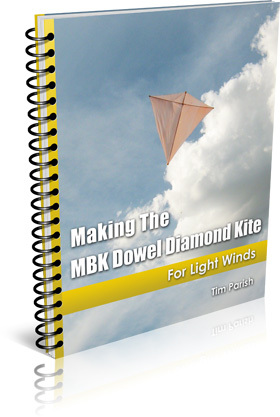 *** When de-rigged and packed down, this kite is the same length as the Dowel Diamond package! "I attempted to make my own kite ... and failed miserably. I made a quick and dirty version of the MBK Dowel Diamond kite and was absolutely amazed at how easily it took off in even the slightest breeze. ... Thanks so much for the help!"